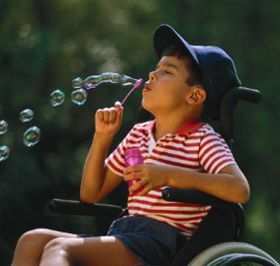 Disabled children do matter ~ Health Matters Today! Many disabled children fail to reach their full potential because they continue to be marginalised in schools, health and social care, according to new research funded by the Economic and Social Research Council (ESRC). "We found that disabled children often experience discrimination, exclusion and even violence," say Professor Dan Goodley and Dr Katherine Runswick-Cole, who implemented the study at the Manchester Metropolitan University. "The biggest barriers they meet are the attitudes of other people and widespread forms of institutional discrimination." "Disabled children are seldom allowed to play and act like other children because of concerns about their 'leaky and unruly' bodies. But our study shows that many children who don't fit the narrow definition of 'normal' have untapped reserves of potential and high aspirations which can be fulfilled when their families receive effective support. There are also many amazing families who should be celebrated for the way they fight for their children.” continues Professor Goodley. The aim of the Does Every Child Matter, post Blair? project was to find out what life is like for disabled children and young people in the context of policy changes set in motion by the New Labour Government after 1997. The Aiming High for Disabled Children policy agenda was intended to enable disabled children to be 'healthy', 'stay safe', 'enjoy and achieve', 'make a positive contribution' and 'achieve economic well-being'. The researchers call for a change of attitude towards disability so that diversity is not only valued, but promoted. "There is an 'epidemic' of labelling children as disabled," Professor Goodley and Dr Runswick-Cole warn. "Parents are repeatedly under pressure to talk about what their children can't do in order to access services and support, but sometimes the label can obscure the individual. Families should be asked what support their child requires, not what is the 'matter' with him or her." Their report recommends that policy should prioritise enabling disabled children to break down barriers by supporting their participation in education, the arts, leisure and their communities and by meeting their communication requirements. "We need to re-think the culture of individualism and performance which pushes disabled children out" continue the researchers. "Pressures on schools are getting worse. We found a case where parents of non-disabled children petitioned to exclude a disabled child. What does this say about the meaning of education and community?" The study found that bullying is often accepted as inevitable when disabled children are perceived as vulnerable. There were several layers of violence, from manhandling in school to psychological bullying, which often goes unnoticed by adults. Some children do however stand up to bullies and refuse to be limited by labels that are imposed upon them. One young person insisted on attending Brownies meetings alone, despite health and safety rules that required her mother to accompany her. "Kids seem to enjoy challenging people's expectations about their limitations," the researchers commented.